1.5 What is so special about EverData? Everdata offers VPS packages at flexible monthly rentals that are appreciated by bootstrapped tiny startups or individual bloggers. It start at Rs.731 per month for decently basic requirements and prices go higher depending upon the features or infrastructure. Their 4 scalable plans come with Sata disks of different capacities (from 20 GB to 120 GB). The monthly bandwidth ranges from 100Gb to 300 GB. Their US VPS packages start from Rs.1499 per month that is quite reasonable. For more demanding clients like e-commerce sites they offer SSD VPS for faster data speed, enhanced stability and higher storage. The package starts form Rs.1750 per month. The Bandwidth range from 200 GB to 400 GB while Disk Space starts from 40GB SSD and 120GB SSD available on both window and Linux. Daily on-site backups and fully managed services can be offered upon request. SSD offers rapid disk I/O performance when some data is retrieved. All plans come with 99.98% of uptime guarantee, round the clock monitoring, guaranteed free resources on India and US hosting and 24X7 quality supports by technically trained in-house staff. If security is your concern or your site attracts traffic fluctuations, then dedicated servers would be best for you. 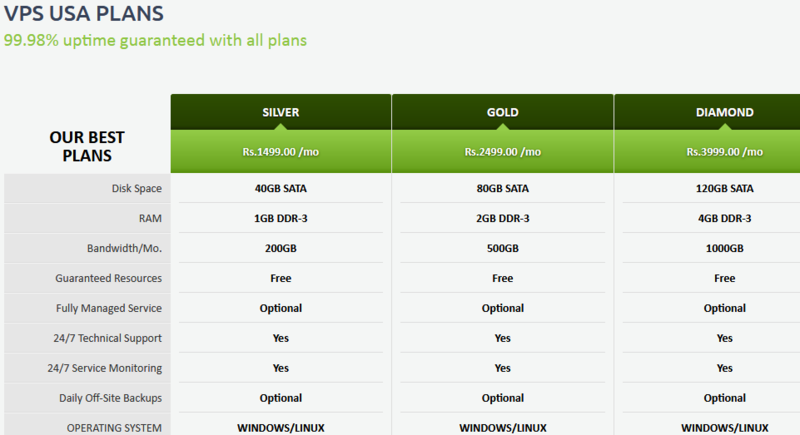 Everdata’s dedicated server starts at Rs.4499 monthly that is quite reasonable for the capacity ad features it offers. 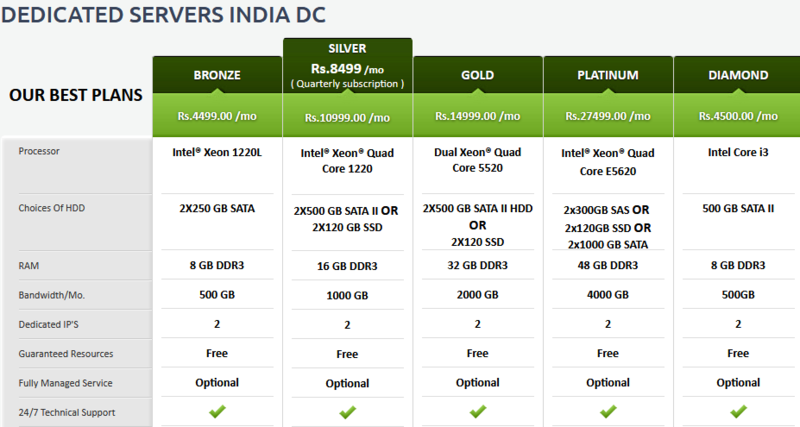 They offer 4 different dedicated server packages of US and India servers’. The ram for US servers range from 6 GB DDR3 to 32 GBDDR3 while the Bandwidth is 5000 GB to 15000 GB. The India server start with 500 GB RAM and go up to massive 4000 GB. There are several choices of HDD including 2X250 GB SATA and 2X1000 GB. Essential resources are provided free with each package while Technical assistance and standard round the clock technical services would be provided. You can also opt for fairly backup or fully managed services. Note that for dedicated servers you need to go for annual service plan as no monthly plans are available here. The cloud service of Everdata is powered by Jelastic and is available in India and USA. Jelastic is a leading technology that offers client friendly features like Vertical and Horizontal scaling, real time high availability, pay as you go. USA cloud service comes with SAN storage with 500hb of monthly data transfer at a cost of Rs.2299 while India cloud is completely scalable and comes with free shared SSL. It works on pay as you go that can save some precious bucks/ The bandwidth per GB starts with Rs. 0095 per hour and goes cost is upto 0.15per hour. It also offers you to pay as you use. Apart from, cost effectiveness it also comes with quick deployment and data security. For fully featured services you can opt for Amazon web services that allows you to select any platform you lie, get core cloud infrastructure applications, migrate seamlessly and get a complete range of management and developer tools. Everdata also offers Microsoft Azure public cloud hosting that is designed for flexibility, productivity and security. Azure comes with fully featured business suite. You can run apps, use analytics, store, use developer service and deliver or stream heavyweight media and audio content on any device. With Azure IoT you can also take advantage of Machine Learning for building sharing deploying and monetizing predictive analytics solutions. Hybrid Integration, Multi factor authentication, single sign in, and multiple threat monitoring and prevention measures are other features offered by Microsoft azure. the best thing is that you will pay only for what you have used. USP: You can customize the packages and tune them to your budget and requirements without being concerned about the quality. What is so special about EverData? How To Get Unlimited Likes On Instagram? How to transfer pictures from iPhone to computer Windows 10?